At the law office Hobbie Corrigan & Bertucio, P.C. Attorneys at Law, we represent individuals in Toms River and throughout New Jersey. Our attorneys have experience handling serious personal injury, wrongful death, criminal defense, workers' compensation and Social Security Disability cases. Regardless of the case we are handling, our mission is always to provide clients with intelligent, experienced and passionate counsel. Individuals do not contact lawyers when things are going well. People contact us when they need someone else to fight with them, and that's exactly what we do. Our clients deserve aggressive counsel, and we work zealously to help them obtain their legal goals. Although we strive to obtain favorable settlements without going to court, we prepare every case for court. If we are unable to obtain the results our clients deserve through negotiations, we do not hesitate to bring our clients' cases to trial. 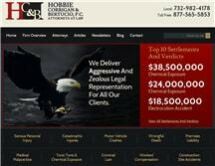 Our law firm is known throughout New Jersey for obtaining the aggressive and effective representation we provide in court, and we earned that reputation for a reason. Each of our partners has tried hundreds of cases, and senior partner Norman Hobbie has obtained more than 70 verdicts in excess of $1 million. Learn more about your legal options and the counsel our attorneys provide by scheduling an initial consultation. We can be reached by calling 732-982-4178.